Venice was not to be missed on the Grand Tour. 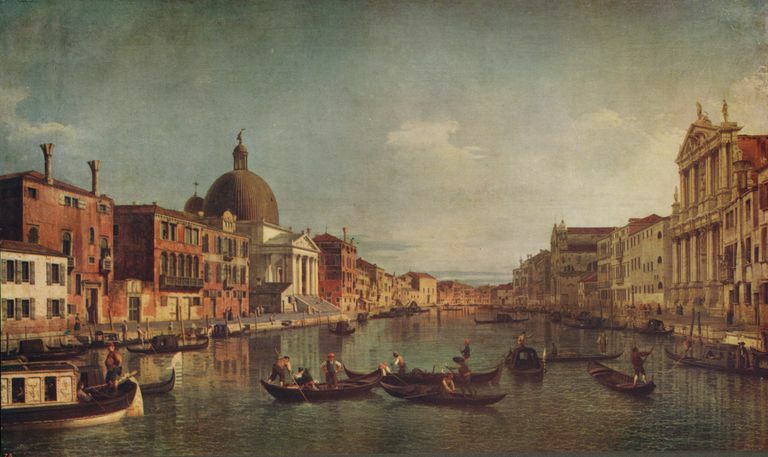 Grand Canal circa 1740 painting by Canaletto. Young English elites of the seventeenth and eighteenth centuries often spent two to four years traveling around Europe in an effort to broaden their horizons and learn about language, architecture, geography, and culture in an experience known as the Grand Tour. The Grand Tour began in the sixteenth century and gained popularity during the seventeenth century. The term Grand Tour was introduced by Richard Lassels in his 1670 book Voyage to Italy. 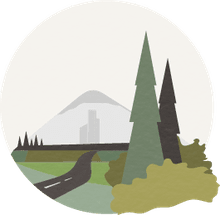 Additional guidebooks, tour guides, and the tourist industry were developed and grew to meet the needs of the 20-something male and female travelers and their tutors across the European continent. The young tourists were wealthy and could afford the multiple years abroad. They carried letters of reference and introduction with them as they departed from southern England. The most common crossing of the English Channel (La Manche) was made from Dover to Calais, France (the route of the Channel Tunnel today). A trip from Dover across the Channel to Calais and onto Paris customarily took three days. The crossing of the Channel was not an easy one. There were risks of seasickness, illness, and even shipwreck. The Grand Tourists were primarily interested in visiting those cities that were considered the major centers of culture at the time - Paris, Rome, and Venice were not to be missed. Florence and Naples were also popular destinations. The Grand Tourist would travel from city to city and usually spend weeks in smaller cities and up to several months in the three key cities. Paris was definitely the most popular city as French was the most common second language of the British elite, the roads to Paris were excellent, and Paris was a most impressive city to the English. A Tourist would not carry much money due to the risk of highway robbers so letters of credit from their London banks were presented at the major cities of the Grand Tour. Many Tourists spent a great deal of money abroad and due to these expenditures outside of England, some English politicians were very much against the institution of the Grand Tour. Arriving in Paris, a Tourist would usually rent an apartment for weeks to several months. Day trips from Paris to the French countryside or to Versailles (the home of the French monarchy) were quite common. Visiting French and Italian royalty and British envoys was a popular pastime during the Tour. The homes of envoys were often utilized as hotels and food pantries which annoyed the envoys but there wasn't much they could do about such inconveniences brought on by their citizens. While apartments were rented in major cities, in smaller towns the inns were often harsh and dirty. From Paris, Tourists would proceed across the Alps or take a boat on the Mediterranean Sea to Italy. For those who made their way across the Alps, Turin was the first Italian city they'd come to and some remained while others simply passed through on their way to Rome or Venice. Rome was initially the southernmost point they would travel. However, when excavations began of Herculaneum (1738) and Pompeii (1748), the two sites became major destinations on the Grand Tour. Other locations included as part of some Grand Tours included Spain and Portugal, Germany, Eastern Europe, the Balkans, and the Baltic. However, these other spots lacked the interest and historical appeal of Paris and Italy and had substandard roads that made travel much more difficult so they remained off most itineraries. While the goal of the Grand Tour was educational a great deal of time was spent on more frivolous pursuits such as extensive drinking, gambling, and intimate encounters. The journals and sketches that were supposed to be completed during the Tour were often left quite blank. Upon their return to England, Tourists were supposedly ready to begin the responsibilities of an aristocrat. The Grand Tour as an institution was ultimately worthwhile for the Tour has been given credit for a dramatic improvement in British architecture and culture. The French Revolution in 1789 marked the end of the Grand Tour for in the early nineteenth century, railroads totally changed the face of tourism and travel across the continent.